From now on, it’ll be the place to find all my blog posts, news, updates, and contests. Thanks for visiting! I dedicated my newly-published novel, Corgi Capers: Deceit on Dorset Drive, to my grandfather, a man I met only in dreams. Below is the account of my meeting with him in a dream, an event that changed my life. I inherited my ability to see beyond this world from my mother. Both she and I have stories in Chicken Soup for the Soul’s new release, Messages from Heaven. To celebrate, I’m giving away a free copy of the Chicken Soup book. To win, simply leave a comment on this blog (below). On February 28, I will choose one random commenter to win a free print copy of the book. Sorry, but due to shipping costs, the contest is only open to those with U.S. addresses. I met my grandfather in a place I wasn’t allowed to see. It was a shadowed world, and when I entered I had the impression that I was being allowed in against the rules. I saw silhouettes only: silhouettes of men moving in lines across a pier. It was calm in a way I have never experienced before. A body of water stretched below; but it, too, was shadowed. I wasn’t afraid or confused: I knew at once it was only darkened for my benefit. It was a place I wasn’t supposed to see or understand, or tell the waking world about. A single spotlight shone down upon the world, affording me a view of the only thing I was allowed to see: my grandfather. He had died twenty-five years earlier. All I knew of my grandfather was what I had learned from my mother. He was her paragon: a caring, dedicated teacher, a talented linguist, and a loving father. He was my mother’s guide and mentor, her inspiration as a teacher and a parent. I had seen a picture of him once, and I recognized his silhouette. He stood just far enough in the spotlight for me to recognize him. He came at a difficult juncture in my life. I had been teaching high school for nearly two years, and I was distressed. My job didn’t make me happy. I planned lessons, I helped students, I graded papers, I sponsored extracurricular activities. Yet I was never happy. I was always tired, empty, unfulfilled. Worse, my coworkers seemed to love their jobs—or at least, they found fulfillment in teaching as a calling. My inability to share their joy left me feeling guilty on top of everything else. The stress of it all had left me sick at all hours of the night, and I wondered how long I could keep the sleep-deprived self-loathing. I had never needed help so much in my entire life. I was thinking about this as I met my grandfather. It was the middle of the night, and I was lying on the hallway floor—close to the bathroom door—wrapped in a comforter. I had dozed into a strangely-still sleep. And then I saw him. My grandfather was in the middle of directing the darkened figures along the pier. Like me, they were in need of guidance, and my grandfather had stepped up to help them. I could tell the figures had just passed on, and they weren’t quite sure of themselves yet; but thanks to my grandfather, they were being led the right way. When my grandfather saw me, he held up his hands the way a police officer directing traffic might do. The men stopped, their figures frozen in space. My grandfather turned to me, but he still wouldn’t let me see his entire face. “Why in the world are you so worried?” he asked me. “Why are you doing this to yourself?” His tone of voice was caring but matter-of-fact. It emanated logic and rationality. He didn’t question how I had come to him; he merely accepted the fact that if I was there, it meant that I needed help. He simply watched me. He knew I wasn’t finished speaking before I did. I could just see in the shadows that his mouth drew up in the semblance of a smile. It was the same expression a parent might have when explaining away a toddler’s irrational fear of the bogeyman. Once again, his voice was calm—and calming, matter-of-fact, and rational. It was such sound, simple advice; but I had made the problem so complicated in my mind that I hadn’t been able to see it for myself. Of course being a teacher didn’t mean giving up on writing! I just needed someone else to tell me. I wasn’t given a chance to thank him or to say goodbye. Instead, I woke up wrapped in that comforter feeling better than I had in a long time. Serenity flowed through me as I climbed into bed and slept straight through to morning. After school the next day, I began work on the first short story I had written since college. When I described the dream to her, the tears welled in her eyes. Her loving father had spent his life mentoring her, and she took comfort in the fact that even from the great beyond, he was still working his magic. NOTE:This blog has moved to its own website, www.valmuller.com! To enter this contest, visit the post here. With this spring-like weather at the beginning of February, it seems strange to post this tale about a snow nightmare. But here it is… the third and final installment. It was ten o’clock. My husband had found refuge in the crowded lobby of the hotel across from the Metro stop. The place overflowed with commuters stuck in the same circumstance. Every room was booked, and many commuters planned to spend the night in the lobby. My husband had been calling at regular intervals for status updates. He always hung up frustrated, for each time he asked I had moved less than a quarter of a mile. But at least I could stop worrying about him. He had his cell phone, he had found a seat in front of a big-screen TV, where he could watch news coverage of the poor saps stuck in traffic on the way to pick up commuters. And more, he—a video game aficionado—had chosen to sit right next to a commuter who worked for a local video game company. Yes, he was all set. He was no longer on my mind. …repeated ad-nauseum in descending keys, with a solo singer taking the first and third line, and an imaginary set of back-up singers singing the second and forth. The song was in response to the trucker, whose warning still hung on my conscience. After a while I wasn’t even singing it anymore. I was kind of groaning aloud and singing the words in my head over the groans. I was frustrated and trapped, and at this point there was nowhere to pull off and rest. Parking lots had not been plowed, and stores were closed. I still had over a quarter tank of gas. I was within two miles of the Metro stop. My husband and I realized ridiculously late that things would have been faster if he had trudged through the snow to find me when he first left the Metro. But it was too late for that now. The radio stations were talking about power outages, and my mind switched to finding gas. The only gas station on the main road and in proximity of all the traffic was a tiny station with very little room for maneuvering on a good day. I knew it would take the better part of an hour just to get gas, and I knew there were many more—and less-crowded—stations closer to the Metro lot. But I worried about a power outage and running out of gas on the way home. Cars were getting stuck in the freezing layer of slush. Two drivers had abandoned their cars at gas station pumps, leaving only three pumps open. The whole ordeal of getting gas—from pulling in the parking lot, pumping, and maneuvering—took upwards of thirty minutes. Most of it was people getting stuck, their car wheels spinning without purchase. My car, heavier than average, never got stuck. Learning to drive through Connecticut winters helped, too, as I understood how momentum played a role in making it through the deepest slush. And besides, the wait for gas paled in comparison to the morale boost it provided. I still had an hour and twenty minutes ahead of me to the hotel, but I drove with confidence, knowing I had passed through the worst of it. With a full tank of gas, I felt confident running the radio and cell phone charger and heat at full blast—however squirrely it may have been to ration those things in the first place. My thoughts turned toward dinner. I had eaten at lunchtime, and I had a half-mug of cocoa before I left. The tin of mints was nearly empty, and I’d gone through the three pieces of gum in my bag. I realized then. I was hungry. Of course I hadn’t thought of this at the gas station. There, my mind had been on getting gas and getting out so the next line of cars could do the same. But now I felt weak with it. There was a hotel restaurant, but it was on the verge of closing. Whatever he ordered for me would be cold by the time I got there. “Just order me a really big piece of chocolate cake,” I said, and I kept an image of decadent chocolate in my head for the duration. I imagined all hotel restaurants stocked such desserts. It was my little chocolate delirium. At 11:15, I finally pulled off of the main road toward the Metro stop. The Metro station is located on Gallows Road, and the irony of the name did not escape me. Its’ a hilly road, and it wasn’t quite plowed. I spent the next half hour navigating slushy roads and vehicles abandoned helter-skelter across numerous lanes.But at least I was moving. At 11:48, I pulled into the hotel parking lot, which was largely unplowed. I left the car parked near the front door. I was riding adrenaline, and no one would have been able to make me move that car. I entered the lobby, and the warmth and light hit me like a tsunami. I felt like an animal, shielding my eyes from it all. And it made me restless: aside from some overcrowding, the affairs of the lobby seemed normal. I saw professionally-dressed clerks typing away at computers behind the check-in desk. I saw business people retiring from the bar after a nightcap. I saw people checking their smartphones and doing work on laptops. Everyone was calm. Everyone was warm. Everyone was dry. I hadn’t even thought about it in all the stress of the journey, but it had been about ten hours since my last bathroom trip, and my bladder was not happy. I remember hearing sympathetic laughter from among the waiting commuters, as if I had made a joke for their amusement. I knew I was misinterpreting things, and my head spun with hunger and fatigue. So I ignored them and hurried to the bathroom. Later, washing my hands, two women were having a mundane conversation at the sink. I looked up at them, and I saw my reflection in the mirror. I had animal eyes, detesting eyes. I had been in survival mode, and I was barely human. They looked back at me and shied away. I washed my hands three times, enjoying the overbearing scent of soap and air freshener, and trying to regain my humanity. When I emerged from the bathroom, I felt a little more human. I’d always heard of people who could polish off whole pints of ice cream during trying emotional times. I had never been one of them. That is, until that night. The restaurant at the hotel had since closed, and they hadn’t had any chocolate cake. But there was a self-service shop with microwavable food and frozen and refrigerated goods for sale. I just shook my head. Only one thing was calling to me. It was a pint of Ben and Jerry’s Chocolate Fudge Brownie. An entire pint. And while my husband drove home, I polished off that pint without a second thought. Our trip home went much faster. Our homebound lane was largely free of traffic, though the Metro-bound lane was still backed up for miles. I watched those people stuck in their cars and knew what agonies lay ahead. I felt like jumping out of the car and warning them. But the chocolate calmed my resolve. I was melting back into being human. The trip home culminated in our un-shoveled driveway covered in 6-8 inches of snow, with a lip of crusted snow at the edge from the snow plow. It was almost three in the morning—I had been gone twelve hours—and I didn’t want to shovel. My husband looked at me questioningly. The car accelerated into the pile of snow, where it got stuck halfway in the street and halfway in the driveway. I had half a mind to leave the car like that until morning, but I feared another snow plow pass might damage the back end. Begrudgingly, I got out to shovel. I was eons ahead of my husband. 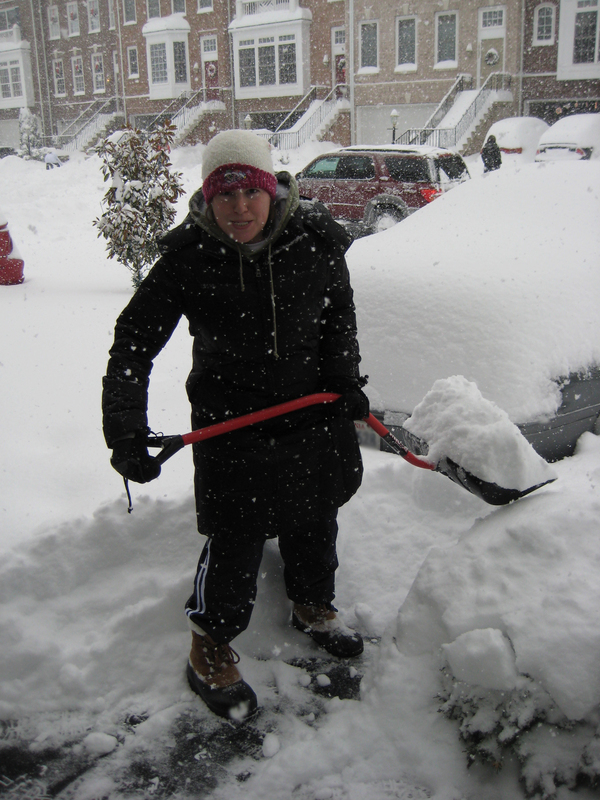 I burned off the reserves of adrenaline and the Chocolate Fudge Brownie calories, shoveling at superhuman speeds. 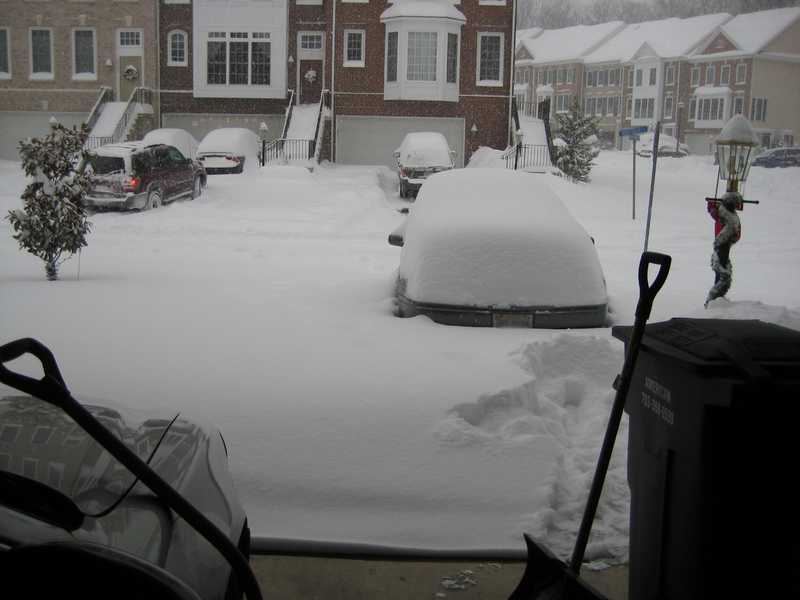 “We just need to shovel enough to get the car in the garage,” my husband reminded me. But I wouldn’t have it. That driveway was going to be cleared, and it was going to be done in ten minutes. It was. I entered the house, noticing the familiar smell a house has—its ability to comfort you no matter what the day has brought. I thought about my husband’s car in the commuter lot, probably buried by the snow plow. I thought about the dogs, who (as young puppies) had been stuck in their crates for twelve hours and would be wound up for sure. I thought about the blinking messages on our machine—messages from HOA residents complaining to the HOA Board (i.e., my husband) about the speed with which the snow plow had arrived at the development. But it didn’t matter. I had faced a hellish twelve hours on the road, something that would haunt me for months. But I had survived. And now I was home. And of course, the silver lining: I’m a believer in fate. When you’re stuck in a hotel lobby for eight hours talking to someone in the same situation—who just happens to share your obsession with video games—you’ve met a fate-friend. This is someone you were meant to meet, someone who may have yet to reveal her role in your life. It’s when you miss your flight. When you get a flat tire. When you randomly decide to go to a place you’ve never been. These things are too great to be coincidences. They are part of a master plan. My husband met a fate-friend that day. Marji Cooper not only shares his love for video games, but she’s an artist. During his ample time to talk to her, he mentioned that I am a writer and would possibly be interested in commissioning an artist to illustrate characters and scenes from my book. It was mentioned just in passing, and I hadn’t yet been offered a contract on the book. We tucked it away in the “maybe” files of our minds. In the meantime, my husband “friended” her on facebook, and we moved on with our lives. When my book came under contract, we revisited the issue, asking Marji to illustrate key characters and scenes for Corgi Capers. And she did an excellent job. Stay tuned for a sneak peek of her work! 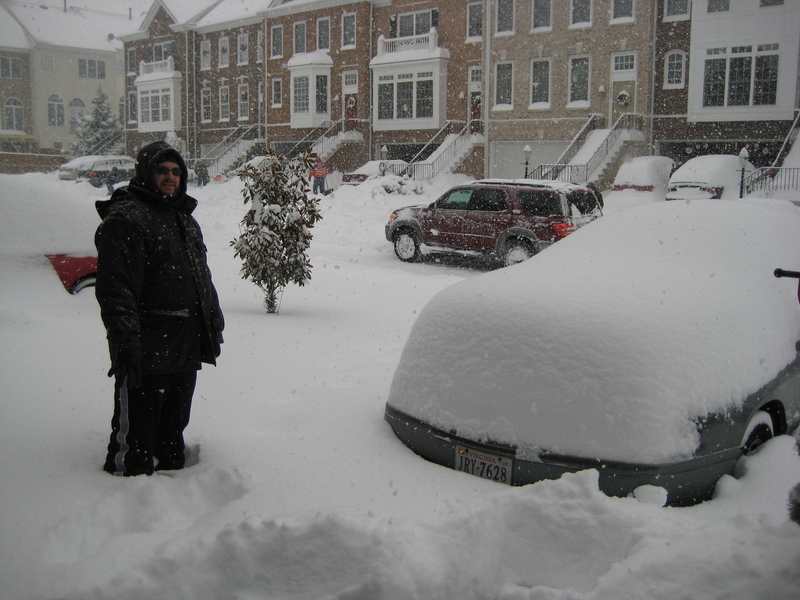 On January 26, 2011, I was stuck in my car for 12 hours during a terrible snow storm. Exactly one year later, January 26, 2012, my first novel was released with Dancing With Bear publishing. One of those days rates among the worst of my life; the other, among the best. It just goes to show. You never know. 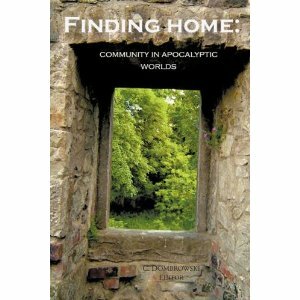 I’m pleased to announce that Finding Home: Community in Apocalyptic Worlds is now available at Amazon.com with Timid Pirate Publishing. My story, “The Girl with Sunrise in Her Hair,” is about a girl’s struggle to find peace and community in a land controlled by a dictator who has declared himself emperor of the remaining world: When the apocalypse comes, a power-hungry man with knowledge of the end has saved a portion of the world from destruction–to serve his own ends. Only Sonja seems to retain her will to think on her own and stand up to the control the emperor asserts over everyone else… until she finds out that she has company. Wondering what this is all about? 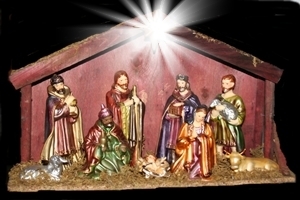 DWB Publishing is announcing its Christmas Contest. For details, listen in at http://www.blogtalkradio.com/worldofinknetwork/2011/12/09/a-good-story-is-a-good-story–host-marsha-cook this Friday at 2 p.m. Find out how you can win! I’ve just found out that two new anthologies were released, each one containing a short story of mine. 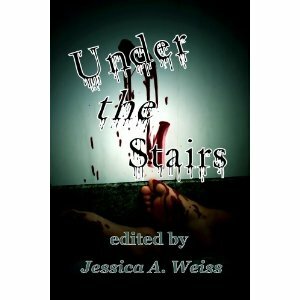 The first is a horror anthology called Under the Stairs and is published by Wicked East Press. My story, “Night of the Fish People,” is about a boy vacationing with his parents in the Caribbean. Awake and alone one night, he watches piscine terrors happen in the resort’s pool. His parents don’t believe him… until his father goes to check things out for himself. 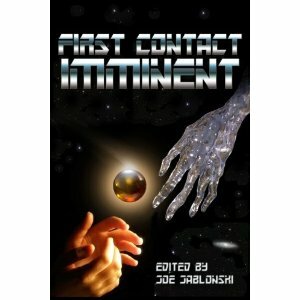 The second anthology is through Red Skies Press, First Contact Imminent. My story “The Astrozen Composer” involves travel to a new world in which synesthesia is necessary because humans can only perceive the new world through music. 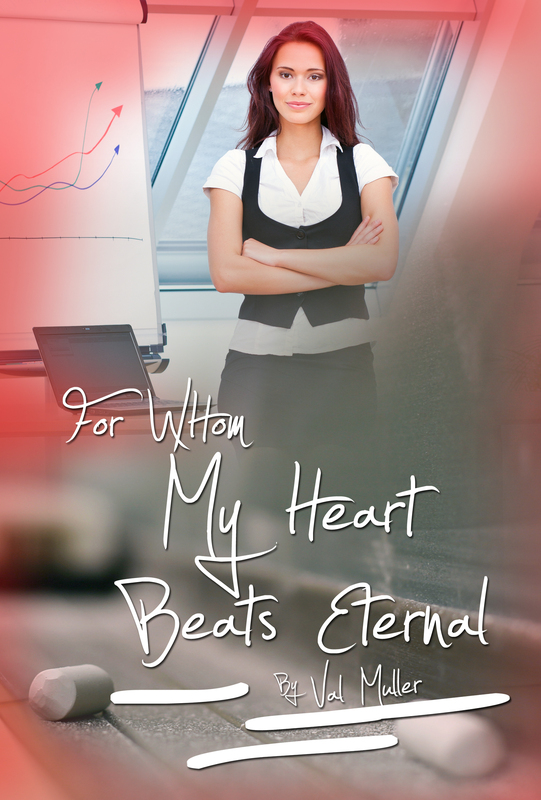 I just received the cover for my upcoming novella, “For Whom My Heart Beats Eternal.” This is a romance story involving a college student, a professor, time travel, and android robots. Yep. Fun stuff. It’s scheduled for release this spring with Rebel Ink Press.